The Reposition All Drawings tool is used to reposition, scale, rotate or skew all drawing strokes on every drawing included in a layer. 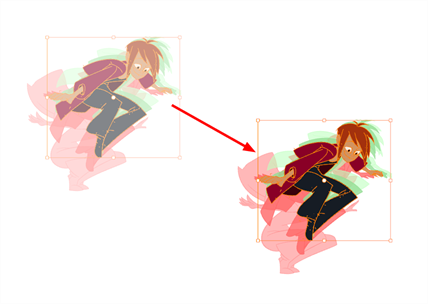 If your hand-drawn animation requires to be repositionned in the grid, as soon as your select the Reposition All Drawings tool, all the strokes in all the drawings exposed on the current layer are selected. You can use the controls the same was as the Select tool—see About the Select Tool. You can use the Drawing Desk feature to select specific drawings and avoid repositioning all the drawings—see About the Drawing Desk. NOTETo learn more about the Reposition All Drawings tool options, see Reposition All Drawings Tool Properties.